Last edited by mr.negativity on Fri Apr 12, 2019 4:25 pm, edited 6 times in total. Only if Chris Pratt gets to play a character leading an elite Ewok speeder bike squad. Yub, Yub, Commander. The Shadow wrote: Only if Chris Pratt gets to play a character leading an elite Ewok speeder bike squad. Yub, Yub, Commander. His name is getting tossed around for that Young Han Solo movie. This is disappointing. Trevorrow's direction in Jurassic World was utterly lacking in anything but the bare minimum of what was needed. lhb412 wrote: This is disappointing. Trevorrow's direction in Jurassic World was utterly lacking in anything but the bare minimum of what was needed. But the movie made a lot of $$$! That's all that matters in Hollywood. ^You can tell Hollywood I say balderdash! Poppycock and balderdash! Yeah...I mean, I like Jurassic World, but I don't think Trevorrow did anything special...though maybe he'll wind up just being Abrams' puppet and really just be the guy pointing the camera while others do most of the work. Colin Trevorrow: Camera for hire. If that were the case, surely Trevorrow's business cards would read "Have Camera Will Travel" ? Neil Turitz wrote: There are a bunch of interesting factors here, not least of which is Kennedy’s desire to bring in hot, young, up-and-coming filmmakers, then refusing to allow them to do the things that drew her attention in the first place. Sounds familiar. If you want to understand the paradoxical madness of Hollywood, you only need to watch one film: Barton Fink. Producers are attracted to writers and directors with unique voices and distinctive visual styles, but then expect those people to snap to attention and cut-and-paste their artistic idiosyncracies into studio templates that test well and tick the necessary marketing boxes. And woe betide them if they step out of line, because the producer has a dozen other people lined up who can give their movies "that Barton Fink feeling". This is what makes Legendary such a rarity (or did in the Thomas Tull era), since they actually trust the people they hire. Borys Kit & Mia Galuppo wrote: Colin Trevorrow is no longer directing Star Wars: Episode IX, Lucasfilm said Tuesday. "Lucasfilm and Colin Trevorrow have mutually chosen to part ways on Star Wars: Episode IX. Colin has been a wonderful collaborator throughout the development process but we have all come to the conclusion that our visions for the project differ. We wish Colin the best and will be sharing more information about the film soon," read a Lucasfilm statement. Rumors of Trevorrow’s departure have dogged the project since early June, weeks before the opening of The Book of Henry, his thriller that was panned by critics and failed at the box office. Sources tell The Hollywood Reporter that script issues have continued to be a sore spot throughout Episode IX’s development, with Trevorrow having repeated stabs at multiple drafts. In August, Jack Thorne, the British scribe who wrote the upcoming Julia Roberts-Jacob Tremblay movie Wonder, was tapped to work on the script. Sources say that the working relationship between Trevorrow and Lucasfilm head Kathleen Kennedy became unmanageable. 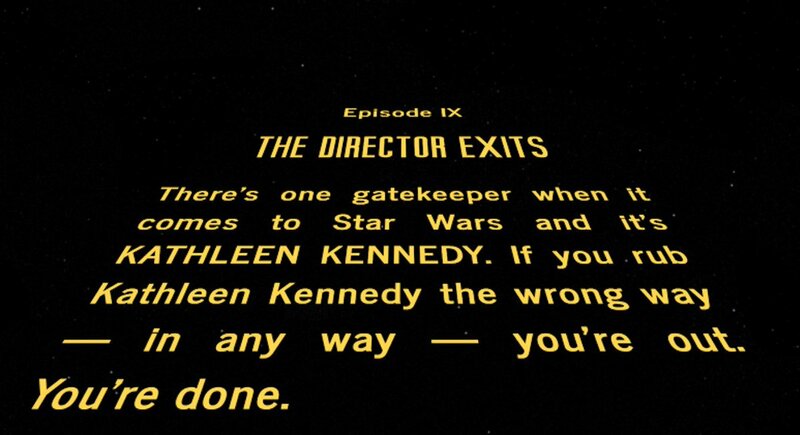 Kennedy, who had already been through one director firing/replacement on the Han Solo spinoff movie, was not eager for a sequel and tried to avoid this decision. In June, Phil Lord and Chris Miller were fired from the Han Solo stand-alone with only a few weeks left in principal photography. The two were later replaced by Ron Howard, who is finishing out production in London. Rumors are already circulating as to possible replacements for Trevorrow. Rian Johnson, who is in post for The Last Jedi (Episode VIII), has been mentioned as a possibility, returning to the franchise. J.J. Abrams, who successfully helmed Star Wars: The Force Awakens, has also emerged as a top contender. Trevorrow's departure now marks the fourth time directors have been replaced on a Star Wars project. Tony Gilroy took over from Gareth Edwards for massive reshoots on 2016's Rogue One. And Josh Trank was taken off of a Star Wars anthology film after reports arose about the helmer's disturbing behavior on the set of Fox's Fantastic Four reboot. Like Trank, Trevorrow's exit occured before the movie has started shooting. Trevorrow first made waves with Sundance hit Safety Not Guaranteed. The indie sci-fi dramedy caught the attention of Steven Spielberg and Universal, who put Trevorrow at the helm of the Jurassic Park reboot, Jurassic World. The movie went on to gross a mammoth $1.6 billion at the global box office. After that success, the director was tapped to write and direct Episode IX, the supposed end to the Skywalker saga that would follow Johnson's The Last Jedi (due out Dec. 15). Back in July, THR spoke to Trevorrow at the Ischia Global Film and Music Fest and asked about the then-recent Lord and Miller exit from the Han Solo film. "Movies are very personal, and art is very personal, and for people to try to turn that into something that is salacious or something that will get clicks is frustrating and sad for me because I know that [movies] mean a lot to everyone involved," he said. "And everybody involved in that movie is passionate about it and worked on it very hard and continues to work on it very hard." Henry88 wrote: you know at this point who would what to be a director of a star wars movie. On the other: Trevorrow just wasn't very good and I was certain he'd either fumble the ball in the last installment of this trilogy or turn out the most bland installment, now I'm more optimistic about the movie and the sequel trilogy as a whole. And I'm nervous that, as bland as I expected Trevorrow's work to be, that they might be looking for somebody with less individual vision. lhb412 wrote: ^You can tell Hollywood I say balderdash! Poppycock and balderdash! eabaker wrote: And I'm nervous that, as bland as I expected Trevorrow's work to be, that they might be looking for somebody with less individual vision. At this point, I'm still somewhat willing to give Lucasfilm and Disney the benefit of the doubt and say that they just rushed forward when they announced Lord & Miller and Gareth Edwards and Rian Johnson and Colin Trevorrow and were trying to create positivity and buzz from day 1 instead of mapping things out and planning first. If this keeps happening on future films, where they don't have the benefit of saying, "Well, we just rushed into announcing before we really had time to get our arms around everything," then I'll be more willing to take them to task. One thing Disney has fumbled that Lucas somehow managed to keep alive all through the years even as he allowed to property to be pillaged and plundered and commercialized beyond reason into a monstrous franchise that nowhere near resembled the small little vision he set out on...the aura of Star Wars no longer really exists, at least to me. It's now just another franchise, and there's nothing special about it anymore. Granted, it's a franchise I enjoy, but there doesn't feel like there's anything "sacred" anymore with Star Wars. It's just a thing. That's kinda sad, though likely inevitable. Star Wars under George Lucas always felt like George Lucas's Star Wars, regardless of the quality of the individual episodes. With Lucas's voice gone, it will almost certainly never again feel like "true" Star Wars (to me). Now that it's this different beast, I guess I'm not really concerned with consistency. If it's not going to feel like Lucas's Star Wars, I'd rather see as much variety and experimentation as possible, because that at least is... honest, I guess? Whereas pretending that it's all still of a piece just strikes me as a kind of pointless pretense. Amazing news. Trevorrow has no business making a Star Wars movie, or even Jurassic Park to be honest. eabaker wrote: Star Wars under George Lucas always felt like George Lucas's Star Wars, regardless of the quality of the individual episodes. With Lucas's voice gone, it will almost certainly never again feel like "true" Star Wars (to me). Now that it's this different beast, I guess I'm not really concerned with consistency. If it's not going to feel like Lucas's Star Wars, I'd rather see as much variety and experimentation as possible, because that at least is... honest, I guess? Whereas pretending that it's all still of a piece just strikes me as a kind of pointless pretense. How would you fell if Lucas came back for Episode IX? At this point, having had no real input on VII and VIII, I'd worry that he wouldn't really feel creatively free to do IX his own way, and we could end up with a very awkward compromise of a movie.